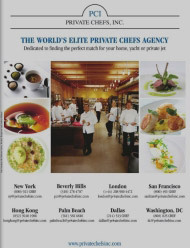 Private Chefs, Inc. is the leading mega-yacht chef placement agency in the World. PCI’s yacht chefs are skilled in a diverse range of cuisine styles and are adept at seeking out regional ingredients at every port of call to create inspired dishes. Our experienced chefs have a thorough knowledge of galley safety, sanitation standards and provisioning in obscure parts of the world. They love traveling and discovering new places and excel at working in confined spaces on rolling waves. In addition, they embrace the necessity for meal planning, provisioning, customizing menus for the individual tastes of clients and adjusting dishes according to sudden changes in location, weather or occasion.